Take flight with us on Friday, April 1 at the Marin Center in San Rafael! Youth in Arts is celebrating our 45th Anniversary with a gala celebration on Friday April 1 at the Marin Center. This special event will give guests the opportunity to sample some of the visual and performing arts that are part of our “Travel the World” school program. 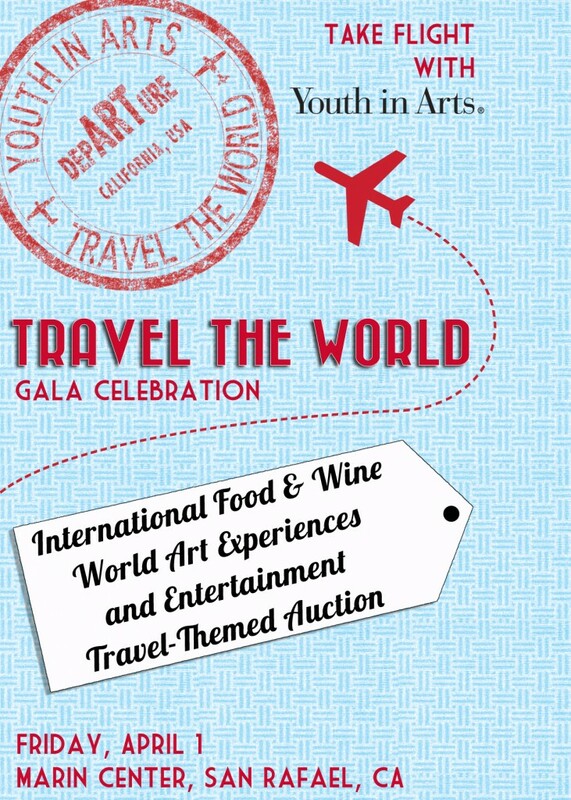 The event will also include a global-inspired dinner, an “Art Market and World Bazaar” with handmade art items created by students, mentor artists and teachers, and a live auction with travel-themed items. The Fund-A-Need will cap the auction, and it will focus on raising at least $60,000 for the Walker Rezaian Creative HeArts Fund, providing an intensive visual arts program experience for kindergarten students. Should Youth in Arts meet the $60,000 goal for the Fund-A-Need, the Fund will be able to reach all kindergarten students in five additional schools in the County! Additional profits from the event will be allocated to the other core arts education programs of Youth in Arts, including “Travel the World”, `Til Dawn A Cappella, C Street Project and Arts Unite Us for students of differing abilities. We have a range of sponsor opportunities for this very special event for you to consider–contact Mecca Billings to find out more about becoming a sponsor today!